1. Which HDTV Antenna is best for me? My rule is… if you are able to put an Outdoor TV Antenna outside or in your attic, then an Outdoor TV Antenna is best for you. The Outdoor HDTV Antennas will give you the strongest, most solid signal and the ability for you to pick up the most available TV channels in your area. Our Outdoor HDTV Antennas are Easy to Install. We offer Free Support, if needed. 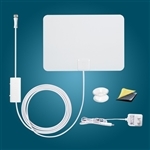 Indoor HDTV Antenna’s will also work for people that live within 8 to 10 miles of the TV broadcast towers. For people to live farther away than 10 miles the broadcast towers, the indoor antenna will still work but you will possibly not receive all the available TV channels. If you live within a couple miles of the TV Broadcast Towers the A-200 will work Great! 2. Are there any monthly fees? There are no monthly fees. The HDTV Antennas will pick up the Free Digital TV signals being broadcast across the USA, Canada, Mexico, Puerto Rico, Guam, and anywhere else that UHF and VHF TV signals are available. No monthly fees! 3. What channels will I receive? The channels you receive will depend on what area you live in. Most people in the USA will be able to receive all the major networks like ABC, NBC, CBS, Fox, Ion, the CW and PBS in HD. Most people in the US will also receive channels like Universal sports, TUFF-TV, Retro-TV, Antenna-TV, This-TV and foreign-language channels too. Yes, the UHF and VHF TV signals that you will pick up with your HDTV antenna are 100% legal and are broadcast over the air across the USA, Canada, and Mexico. 5. Will these HDTV antennas work with my old tube TV. 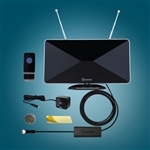 Yes, all of the HDTV antennas that we offer at TV Antenna Sale.com will work with standard tube TVs when connected to a Digital to Analog Converter Box. Note: most every HDTV manufactured since 2006, comes with a built in ATSC Digital Tuner. 6. Is it easy to install? Yes, all of the HDTV antenna's we sell are easy to install. The Indoor HDTV antennas simply plug the power supply into a regular wall socket and then screw coaxial into the back of your HDTV. If you have a standard television you apply the coaxial into your digital to analog converter box then plug your digital to analog converter box into your television. Our Outdoor HDTV antennas are lightweight and come with a plastic housing and do not require to be grounded. They also include a pole mounting bracket 30 feet of RG six coaxial cable and detailed instructions on how to set it up. I only get one channel, but it's very clear. don't work the way a was thing,to much money for price. I use this antenna for a tv on my deck and it works fine. I always get the major networks and more that are about 9 miles away. Works better on my deck than down on my basement tv.